After a bit of discussion with a number of people we have decided to offer some specific race photo package deals. We are doing a prepayment special deal and a post series price as well. There are 5 races in the series. Dreamsport will have at least one shooter at every race and 2 for most of them. We can’t guarantee to get every runner but we will do our best to get good photos of as many people as possible. In most cases there would be more than 1 photo per race – often 3-4. Over 5 races that could turn into 15-20 photos. We also generally shoot some starts and crowd shots at each event (if its not raining) and that will increase the number of photos. We are also prepared to include kids photos from the Junior Dart with their parents photos. 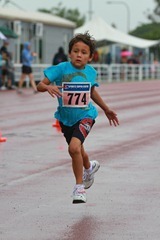 So if you and your kids come to 5 races there are likely to be 30-50 photos of you all. Of course no matter how hard we try there are always some people who never seem to get in any photos. We also understand that for various reasons people cant be at a given race due to other commitments, injuries and so on. So we have created packages that allow you to get all the photos from any number of actual races. The prepaid option is cheaper but is a gamble based on what might or might not show. Of course photos wont be delivered until after the series. It would be in your interests if you have prepaid to stick yourself in front of the lens whenever you see us on course at the finish line or snapping crowd shots. And of course we are always happy to oblige with posed shots before and after each race. Please email sales@dreamsportphotography.com to access this deal. We accept credit card and bank deposit. Prepaid sales must be made before the selected races occur. Eg if you are choosing the last three races then before they start. For 5 races please pay before the 2nd race in March. "Working with Tim was a fantastic experience, from the time I first contacted him, to getting the finished photos back. He responded to all of my queries quickly, and found a perfect location for my shoot. On the day he was very friendly and professional, and I felt super comfortable during the shoot. The photos I received are absolutely gorgeous. Thank you!"